The challenge is to create a piece of decoupage - I had just recieved my Bloom and Grow Decoupage book ( http://www.jasmine-cards.co.uk/ )and I have to say I was very impressed. Beautiful papers and texture (some are embossed) I also recieved the button/ribbon box - yum! I have created some decoupaged flowers that clip over thank you notes - yes still making thank you's for Hope's Birthday pressies. 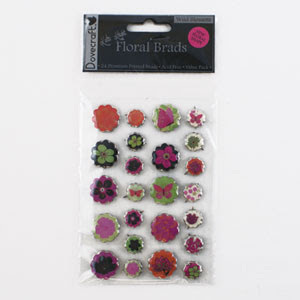 Very simple to do - added a little ink to edges of die-cuts - set pipecleaner through middle of flower with an eyelet. Bent pipecleaner back to create stem and tendril. Cut a small notelet from Bloom and Grow co-ordinating paper. Shaped petals of flower with scissors and they easily slot over the top of notelet. ooh Claire you make it look so easy!! I wish I lived in Scotland as Id ask for lessons from you! Beautiful cards, really lovely! Hi Claire! This is just fabulous!! Love your creativity! I was wondering if there is a way to reach you? I don't see your e-mail. Mine is deenaperreault@hotmail.com if you could reply to me thanks! oooooohhhh Claire what a fabby idea. I have been playing with this decoupage pad this past week and its fantstic, but wouldnt have thought of making these... thanks so much for sharing the idea :)Isn't ti snew collection gorgeous? 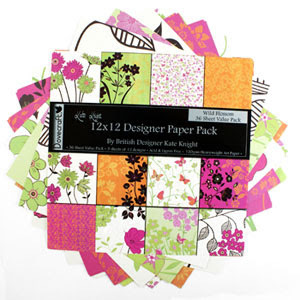 I have bought both sets as some of the papers really do mix and match well.... off to see if i have an chennille stems... i think i gave them all away! errrhhmmmm!